Posted on	Wednesday November 17, 2010 in News., Notes. It was 1975. My family had just moved into the current home. Today, we found evidence of that. The oddest feelings washed through the members as we looked into the past through the crumbling, tart pieces of paper. 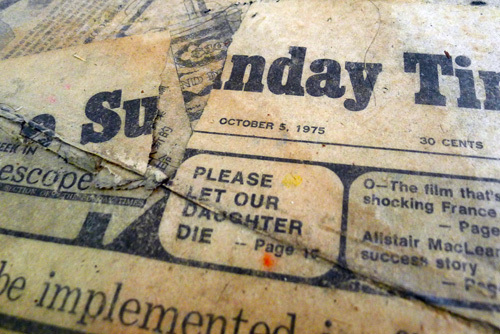 Lined beneath the flooring, every day, we stand on our history. Reading from right to left, a refreshing change for the eyes. 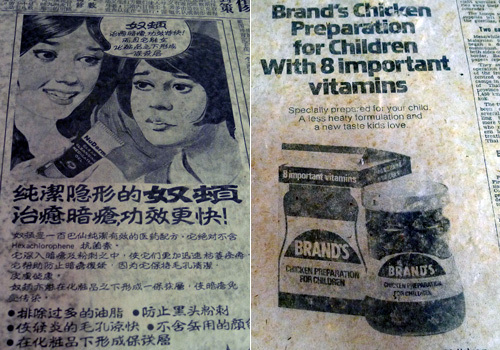 In those days, the advertisements were not as fancy. Few photographs, mainly of line art and hand drawn faces. The play with font-type remains unchanged till today. 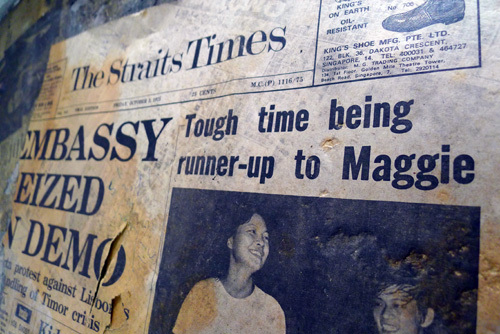 Wonder how they are now... Maggie and the runner-up. Posted on	Sunday August 1, 2010 in Notes., Quotes. I know people say life goes on, and it does, and no one tells you that’s not a good thing. Why is that? Get out of here and move forward. This never happened. It will shock you how much it never happened. You’re not good at relationships because you don’t value them. Posted on	Wednesday May 19, 2010 in Notes. I am not known to be big on social norms. Not challenged but my default preference to keep things short makes it tough to keep to a solid group of professional pals. Most of my friends have good (and close) relationships with their service providers. And they seem so well-adjusted, pampered, and understood. Totally envious. Today I visited one person whom I wish to develop such a long term relationship with. In the past 12 months, I have visited him three times. We don’t really talk. I will sit still while he works the scissors. Few questions and answers will be exchanged and sometimes, we laugh. He blends into my system very well. Think his assistant likes me too. Good sign. All these despite my innate dislike for salons. I am proud of myself. This is tough work and I have many more to engage and enroll into my life. I admire everyone who works it so effortlessly. Posted on	Sunday April 25, 2010 in Notes., Travel. I am proud to be a fairly tolerant commuter. Toe-stomping umbrellas and shoulder-bobbing heads don’t really bother me. 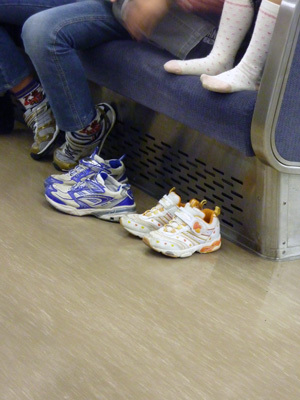 There is one thing that really gets to me – the irresponsibility of allowing children to step on the seats with their shoes on. Most common defence from parents – the shoes are not that dirty. Really? Then I saw this in Osaka. It must be the norm in that part of town. Almost every child (those who wish to put their feet up) will remove their shoes without being told/asked. It is a small thing, perhaps to most people. But it certainly can be done. Ever been shoved and literally pressed against a stranger’s back? At least in Singapore, you are not expected to go cheek-to-cheek even during peak hours. 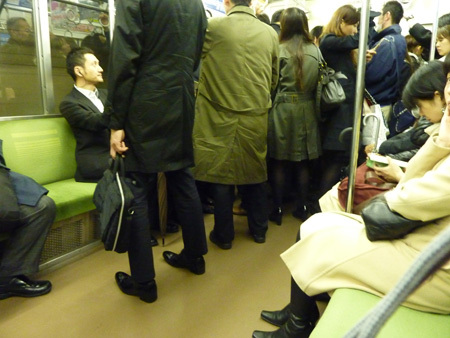 Tokyo metro is crazy as it is, the morning rush is something I can do without. I must apologise to the people who had to put up with my laptop-backpack. I never do have the chance to put it down or up! So before anyone decides to berate Singaporeans and their ugliness while on their way to work, one should realise that such behaviour is not unique. Clustering at the doors is your best bet to getting off at the right stop, and not the one after. Posted on	Saturday November 1, 2008 in Notes., Travel. This week, I have preached to alot of people to keep an open mind. What an irony. Like most people (even if they deny it), I do not fancy the mannerisms of the Chinese road users. I used to take more than 20mins to cross 2 streets. I hang on to the seat belt with both hands because it cannot be fastened. Cab drivers in China will actually make one miss our Comfort cabbies. 2 days ago, on my 7th visit, I was told off by a cab driver for boarding his cab. He had just turned in to drop off a hotel guest. Apparently if you are in the hotel taxi stand, you should only take cabs that are in the queue. To my defense, I was ushered into the error by the hotel staff. With a sigh, “It is not right. They have been waiting.” His eyes were still on the queue behind us. I felt an instant guilt and surprisingly proud of him. Shanghai has always been my favourite city in China, it is just getting better. 2 blocks later, he came so close to a car in the next lane that I could actually count the number of fries in the lady’s lap. 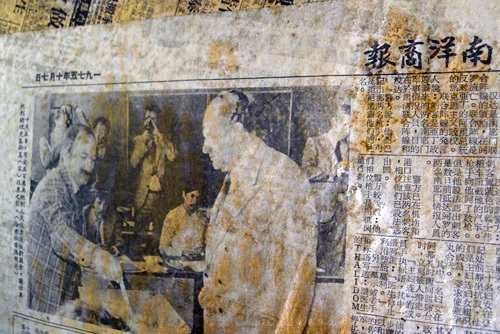 Sidetrack – The whole Beijing city smells of antiseptic solution. Taking ‘cleaning up’ a little too far?